This is the Airship 2 tiny house designed by Roderick James Architects. It’s a unique tiny house vacation in Drimnin, Highlands, Scotland. Please don’t miss other tiny homes like this – join our FREE Tiny House Newsletter! 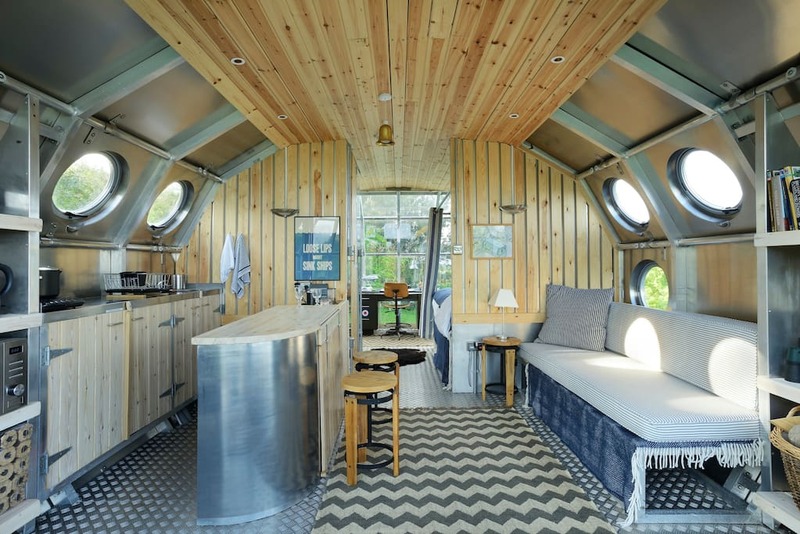 AirShip 2 is an iconic, insulated aluminium pod designed by Roderick James Architects, with galley, double bed, shower, flush wc, spring water, mains electricity, balcony and sitting area. It is situated in a beautiful, secluded position on a 4 acre site with stunning views across the Sound of Mull towards Tobermory (on the Isle of Mull), and out to sea, towards Ardnamurchan Point. There is a house on the site which is occupied but you have privacy and freedom to walk anywhere. I do love this! Kitchen is real cool. Seems airy and light. Like how it looks like no other home around it. Be risky for some things. This is awesome. Forget holidaying, this could easily be lived in all year round. Only problem I can see is that the stupendous views would put you off working. I would spend all my time just sitting looking, though I suspect my painting output would increase. Fabulous. Paying to heat, cool it is going to be real high with alum framing bridging the walls with glass inbetween. Awesome!!!! So different and very efficient. LOVE the windows to the view. I don’t normally go in for the cold sterility of steel, but the shape, big views and width really keep it from looking like the THOWs and it feels roomy and clean. Don’t think I could live in it for long periods, but it’s definitely a vacation doer!! Wow, how cool is that!!! IMHOO…. looks weird. Inside. And out. I “personally” couldn’t live in that for any period of time. At. All… but obviously I’m in the minority going by current postings. And that’s all good, it’d be sad world where we’d all live just the same. Love it. I would like to have one as a vacation cabin. Holy ….. Jeezus Mary n Joseph. I’m leavin’ tonight. Puts my own tiny to shame. Love it. I’m of the Clan Douglass of the Black Douglasses. Canno’wait to go home.